Meet the Chef, Darnell Daniels! This year marks Chef Darnell Daniels’ 10th year at The 1840s Carrollton Inn. 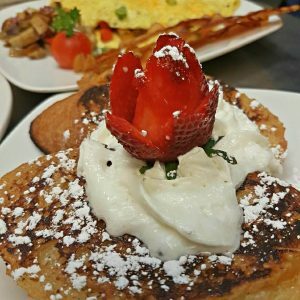 Darnell continues to dedicate himself to bring The 1840s Carrollton Inn a menu rich with authentic home-style flavors and artistically creative presentations. Over the years, Chef Darnell Daniels has worked in local kitchens throughout Baltimore City. 10 years ago, he joined the 1840s staff and is now the Head Chef and Executive Housekeeping Manager. Today, he can be found in his kitchen, at The 1840s Carrollton Inn. 1840s is a historic boutique hotel with 13 rooms and suites in the heart of Baltimore’s Little Italy neighborhood. 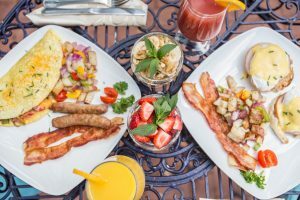 Breakfast is included in this unique hotel experience and is always fresh and made to order. 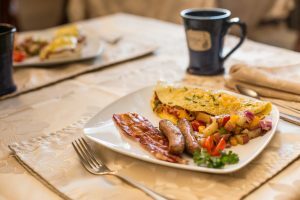 Guests can enjoy their delicious breakfast in the private dining room, out in the gorgeous courtyard gardens, or served in the comfort of their own room or suite. 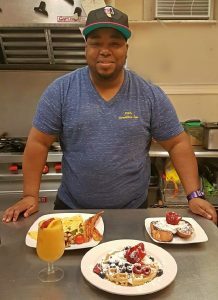 Chef Darnell enjoys creating new breakfast menu items and gathering fresh ingredients at the Koinonia Organic Farm. He also loves to find new and creative ways to garnish and present his meals. In addition to Darnell’s exemplary cooking skills, he loves spending time with his family and watching sports. “I love to cook and it is important to get feedback about the food I make.” comments Chef Darnell. Darnell receives the most compliments on his Eggs Benedict. When asked about his secret to perfecting the dish the Chef said, “No secrets. When you like what you do, it turns out right!” Personally, I love the banana pancakes. As a self-proclaimed pancake connoisseur, I can honestly say you won’t taste better in Baltimore! Book a room today at the 1840s Carrollton Inn and taste for yourself!